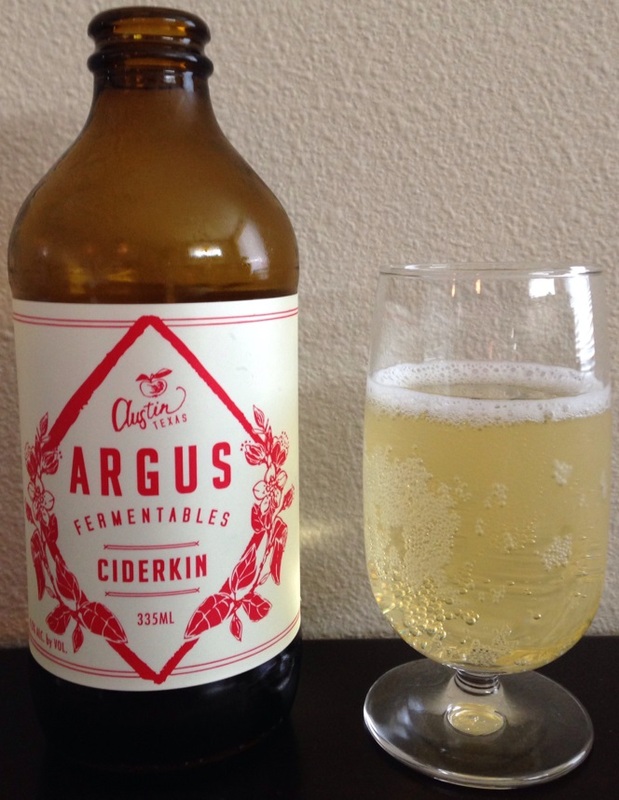 Review of Ciderkin from Argus Fermentables, a traditional dry sparking cider. This is the first cider I’ve tried from Texas! The Fermentables line is a newer branch from Argus, offering cider in six packs instead of 750ml bottles, and currently includes Ciderkin and Ginger Perry (link). Ciderkin was released Match 2015. Their traditional cider line is released by vintage and includes a number of sparking options, and they even have a sparkling Tepache (fermented pineapple juice with spices). 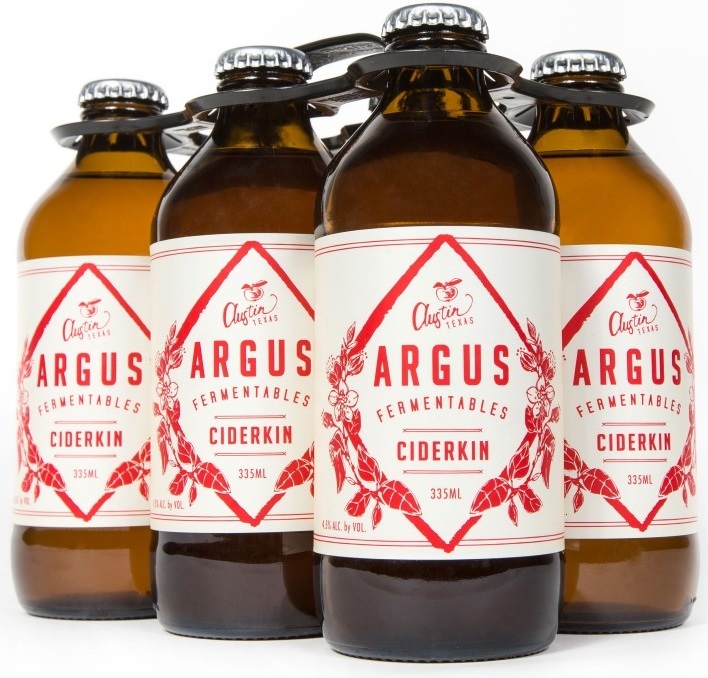 Cider Description: Based on nostalgic profiles of ciders everyone first experienced, Argus Ferementables Ciderkin delivers a straightforward apple palate, yet finishes dry and tannic. Traditional Ciderkin is made from reconstituted apple pomace that is pressed and fermented wild to produce a low ABV-dry cider style. Expounding on that tradition, we have employed a yeast blend that finishes dry, yet still preserves a prominent stone fruit nose and apple palate. Tasting Notes: Apple, Cherry, Caramel, and Citric Nose. Round apple palate with dry, tannic quick finish. No candy-liger, and exceptional with food. 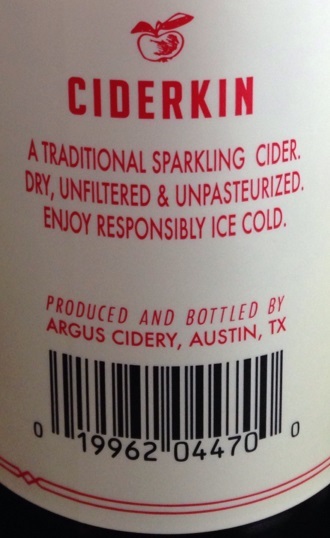 Cidery Description: Argus Cidery is the first cidery in Texas, founded in 2010. They specialize in sparkling and still European-style Basque-influenced ciders and currently use only Texas-grown apples. The Argus Fermentables brand expands the cidery’s reach by featuring ciders that are not necessarily European in style and by sourcing apples from outside the region. How Found: Browsing. The unique neck-less bottle drew me in, the the low cost and cidery location (Texas of all places) convinced me to give this cider a try. First Impression: Definitely sparkling (I even waited a minute to take this photo). Pretty champagne-like color. Smells dry, of apples & pears?, earthy, of citrus, and acidic. Opinion: Dry, but of an easier to drink variety that doesn’t immediately turn me off to the cider like many drier ciders do. This is a clean & crisp tasting smooth cider which is light & citrusy. It has a quick finish but some lingering (pleasant) aftertaste. There is a bit of acidity, bitterness, and astringent drying tannins at the end, but not overly so. This cider has a bit of an earthy funk. I even pick up a hint of vanilla. There is only a slight tartness. The sparking mouthfeel was enjoyable (I’m typically a big fan of sparkling ciders). I don’t however notice cherry or caramel as Argus’ tasting notes specified, but I admit my palate isn’t refined. I would describe Ciderkin as unique but not bold. I nibbled on some crackers while enjoying this cider before dinner, which worked well. Ciderkin is a refreshing cider for summer. Interesting Fact: As discussed a bit in Argus’ description of this cider, Ciderkin is a traditional term to describe cidermaking by fermenting reconstituted apple pomace (pulp remaining after crushing apples). As the pulp is diluted, the alcohol content is significantly reduced. Closing Notes: This is a great introduction to drier ciders, and fairly unique. Give it a try if you can find some! From what I’ve found online, it appears very lucky that I was able to find this in my area as I can’t find much of anything about it being released outside of TX. 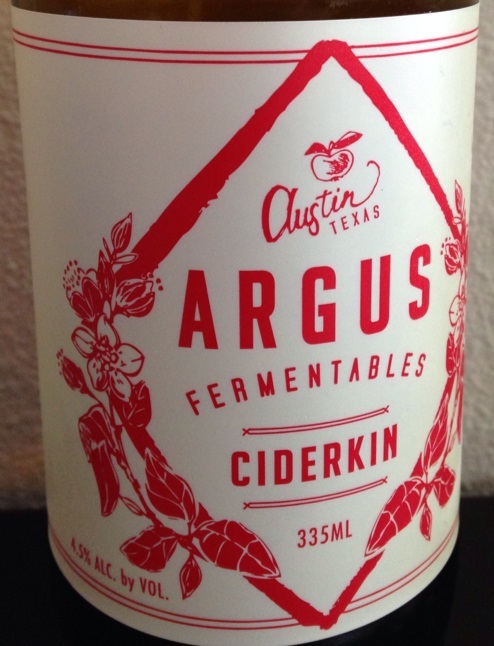 Have you tried Argus Fermentables Ciderkin, or anything else Argus Cidery produces? What did you think?